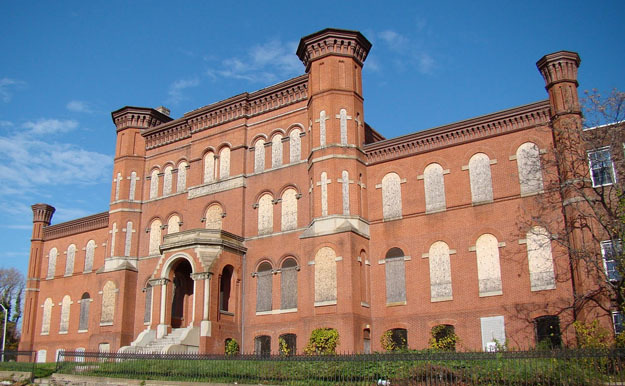 Baltimore Heritage is currently working in partnership with the Coppin Heights CDC and Coppin State University to preserve and plan the rehabilitation of the Hebrew Orphan Asylum Building. Our efforts have received coverage from the Urbanite Magazine and Baltimore Brew. Coppin State University has received letters of support from the Jewish Museum of Maryland, the American Jewish Historical Society, the Hebrew National Orphan Home Alumni Association, and Preservation Maryland for their commitment to preserve and rehabilitate the building. The history of the Hebrew Orphan Asylum site spans nearly 200 years of development from its beginning in 1815 as “Calverton,” the country home of Baltimore banker Dennis Smith, to its vital role providing social and medical services for the City of Baltimore, first as the Baltimore City and County Almshouse (1820-1866) and then as the Hebrew Orphan Asylum (1872 -1923). The building transitioned to serve as the West Baltimore General Hospital (1923-1945) and finally as the Lutheran Hospital of Maryland (1945-1989). The original Hebrew Orphan Asylum building has unfortunately been vacant since 1989 and has been owned by Coppin State University since 2003. The Hebrew Orphan Asylum was designed by Lupus & Roby, the partnership of Edward Lupus (1834-1877) and Henry Albert Roby (1844-1905), and constructed by Edward Brady (1830-1900). All known Jewish orphanages built as such prior to 1875 appear to have been lost, making the Hebrew Orphan Asylum the oldest purpose-built Jewish orphanage in the nation. For more information on the history of the site, please see the submitted National Register of Historic Places nomination for the property, prepared by Baltimore Heritage in partnership with the National Trust for Historic Preservation.